CLAUDIA PELOSI is researcher in Analytical Chemistry at the Department of Cultural Heritage Sciences of the University of Tuscia. She uses spectroscopic techniques to study the materials of cultural heritage: Fourier transform Infrared spectrometry, micro-Raman spectroscopy, X-ray fluorescence coupled with X-ray diffraction technique. Claudia Pelosi is working on Laser cleaning tests of different kinds of sculpture materials. 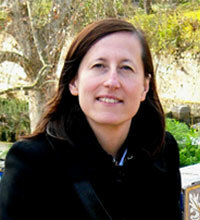 Moreover she is interested in laboratory tests on traditional and novel consolidant products for wood artefacts. She is author and co-author of 115 scientific publications.